The property, surrounded by sprawling trees, is more than just a nice place for a coffee break. The farm offers you the opportunity to harvest, process and then roast coffee beans for your very own cup of joe. A walk through the farm’s 24.5 acres, deep in the forest of Higashi Village in northern Okinawa, costs a reasonable 500 yen ($4.50) and provides a close-up view of the cherries growing in abundance now. It is from these coffee cherries’ pits where coffee beans come from. Before they had beans, Matayoshi Coffee Farm grew roses. But, significant typhoon damage on the farm nipped the roses in the bud, making coffee the farm’s second life. There are optional tours available to offer some of the farm’s history and a hands-on look at the inner workings of growing coffee from seed to cup. When I visited the farm in January, there were already many green and red coffee cherries hanging from the trees. Takuyuki Matayoshi, president of the farm, said the trees begin to bear the cherries before the start of a new year. 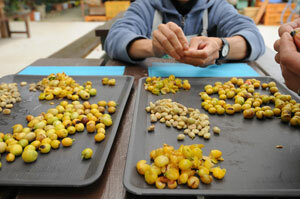 “The high season of picking is expected to be sometime in mid-March through April,” he said. The coffee farm is partitioned into several sections, each of which is enclosed in netting to protect the fruit from birds. Only non-feathered visitors are allowed inside. During the two-hour coffee cherry-picking tours offered at the farm, visitors can go through the process of harvesting, processing, and roasting coffees beans before brewing their own cup. And that hard work is beginning to pay off, as more locals and foreigners are starting to visit. “Coffee is something people can relate to wherever you come from. Plus, our sign probably looks familiar… as they drive by, because they would not see boards with alphabet letters (or English) at other places,” Matayoshi noted. The farm, with its prime location, also provides something for adventurers. Into camping? Matayoshi is home to its very own camp site for those who want to rough it and cottages for comfortable overnight stays. Those seeking a little more can also drive ATVs or ride horses on the property. Participants of ATV tours also get to enjoy a ride on a TUK-TUK under the shade of the coffee trees. And if you get hungry or want to relax while your family enjoys the extreme sports, there is also an on-site café serving up shaved ice for cooling off and organic breads and cakes which pair perfectly with their locally-sourced and roasted coffee. At Matayoshi Coffee Farm you’ll come for the coffee, but you’ll stay for the landscape and other fun activities. It has something for everyone even for those looking for something beyond a solid cup of joe. Direction: Go north on route 58 and make a right to route 14. Go straight on route 14, which merges onto route 331, takes you to the farm. 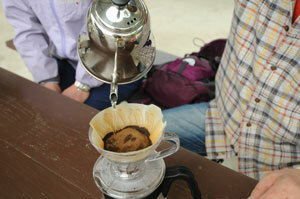 According to the Okinawa Coffee Association, coffee farming existed in Okinawa about 100 years ago. It wasn’t until recently, however, that large-scale farming began on the island. According to a 2014 survey referenced in the Wall Street Journal, the Japanese were consuming around 11 cups of coffee per week with the number expected to grow. According to the National Coffee Association, ideal locations of coffee farming are in “The Bean Belt,” which is found near the Equator between 25 degrees North and 30 degrees South. Located at 26.6 degrees North, Matayoshi Coffee Farm is close to the coffee belt. The temperature is also an important factor. 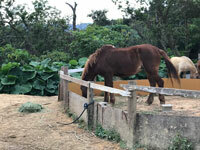 With Okinawa’s average temperature being above 15 degrees Celsius (or 59 F) the farm also checks that box. “Frost is a killer. 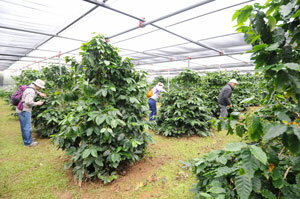 Coffee trees will die if the average temperature goes lower than 15 degrees,” said Mizuki Wada, a farm employee. The NCA says that depending on the variety, there is a 3 to 4-year-wait for newly planted coffee trees to bear fruit. 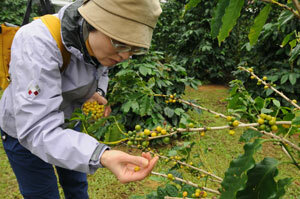 For Matayoshi Coffee Farm, the coffee cherries took about four years to bloom.